Lucia Reply20:2927/08/2015 Dear Romer, sorry, we have not found the record about lucky coins, please have a double check, thank you for your support in our game. Kael Reply18:1428/08/2015 Hello, according to our database, you have got Serpent Totem(Garnet), please check your totems page. Thanks for your cooperation. but i\'m wondering why i still got no totem in my totem section. to be sure for this i want my 1800 coins be refunded as a cause of inconvenience during the server update. I\'m asking fro the approval of the Dev. Team regarding this and pls. do appropriate action. 1800 coins is not easy to get if u don\'t use many diamonds. Therefore as good player, I\'m requesting for the refund of my ;lost totem chest worth 1800 coins from the lucky tree. Dear Romer, sorry, we have not found the record about lucky coins, please have a double check, thank you for your support in our game. 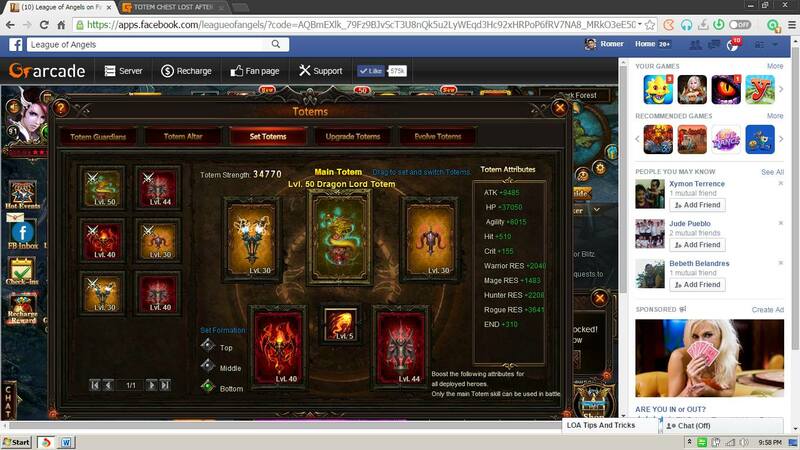 Hello, according to our database, you have got Serpent Totem(Garnet), please check your totems page. Thanks for your cooperation. Dear player, I will report this, meanwhile can you provide me with screenshot proofing you didn\'t have the totem and if possible the 0/1 in lucky tree. Can you post the photo here? also what chest is missing? OK, I\'ve update the report. Please be patient for now. 2019-4-19 01:19 GMT+8 , Processed in 0.064151 second(s), 52 queries .